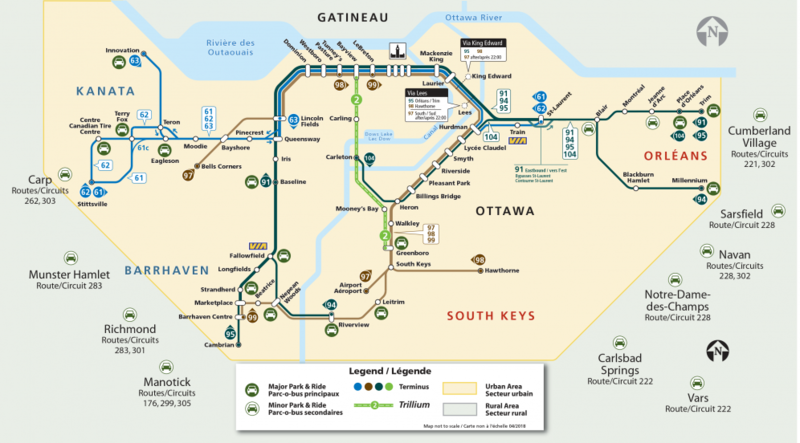 Rural Park & Ride lots are also available, with limited bus service (not on the Transitway). We offer over 9,000 free spots at Park & Ride lots across the city. At busy stations, monthly pass holders can reserve their space by buying Gold Permit Parking. At the Baseline Park & Ride, regular permits are mandatory before 11 am. Note that this permit is not available to Algonquin College Staff, students or visitors. All the spots at Telesat are Gold permit-only spaces. During busy times of the year, especially in winter, some lots will fill up early in the morning - before 8 am. Check out your station below for lot maps and relevant parking permit information. Parking at Baseline Park & Ride weekday mornings before 11 am requires a permit. Permits are on sale from the 15th of the previous month to the 14th of the current month at a cost of $24.50 / month and can be obtained by calling our Park & Ride Administrator 613-842-3777 or through the Lincoln Fields and Rideau Centre Customer Service Centres. The lot is located on Woodroffe Ave. at Baseline Rd., just across from Algonquin College and is not available to Algonquin College students or staff. Parking is free on weekdays after 11 am; during weekends and on holidays. On an average weekday, Baseline Park & Ride fills up by about 9 am. Call 613-560-1000 plus 3017 up to 6 days in advance or text 560560 plus 3017 to hear the next departure times. Customers will be asked to provide their current monthly pass or PRESTO card to purchase a permit. All parking spots at Blair (Telesat) require a Gold Permit. Located at 1580 Telesat Court. Can accommodate 21 cars and is for Gold Permit holders only. Call 613-560-1000 plus 3027 up to 6 days in advance or text 560560 plus 3027 to hear the next departure times. To guarantee a parking space you can obtain a Gold Permit. Gold permits are subject to availability. You will need to prove that you are a monthly pass holder when you buy a parking permit. Located at the Bob McQuarrie Recreation Centre on Youville Dr. and Jeanne d'Arc Blvd. Can accommodate 60 cars for Permit holders ONLY. Permits are sold upon availability. Call 613-560-1000 plus 3070 up to 6 days in advance or text 560560 plus 3070 to hear the next departure times. We are currently sold out of Jeanne d'Arc Park & Ride permits. Also served by all trips on Route 92 until 7 pm. Call 613-560-1000 plus 3059 up to 6 days in advance or text 560560 plus 3059 to hear the next departure times. Shared use lot located north of Stittsville at Hwy 417. Call 613-560-1000 plus 3059 up to 6 days in advance or text 560560 plus 2195 to hear the next departure times. Parking at Eagleson fills up fast! There are other Park & Ride lots in Kanata to help meet your needs. Located at Highway 417 and Eagleson. Call 613-560-1000 plus 3055 up to 6 days in advance or text 560560 plus 3055 to hear the next departure times. We are currently sold out of Eagleson Gold parking permits. Located at 100 Via Park Way, at Fallowfield Station. Call 613-560-1000 plus 3043 up to 6 days in advance or text 560560 plus 3043 to hear the next departure times. We are currently sold out of Gold parking permits for Fallowfield Park & Ride. Located at Bank / Johnston. On an average weekday Greenboro Park & Ride lot fills up by 8 am. Call 613-560-1000 plus 3037 up to 6 days in advance or text 560560 plus 3037 to hear the next departure times. We are currently sold out of Gold parking permits for Greenboro Park & Ride. Call 613-560-1000 plus 3057 up to 6 days in advance or text 560560 plus 3057 for next departure times. Located on Gilligan Road, south of Leitrim Road and just west of Albion. Can accommodate 299 cars and will eventually hold up to almost 1200 vehicles. Amenities include a bus shelter, bike rack, ample lighting, a drop off/pick up zone, camera surveillance and emergency callboxes. Call 613-560-1000 plus 3041 up to 6 days in advance or text 560560 plus 3041 to hear the next departure times. Located in Orléans, just east of Trim Road on Millennium Blvd. near Gisele Lalonde school. Can accommodate 171 cars and will eventually hold up to 574 vehicles. Call 613-560-1000 plus 3076 up to 6 days in advance or text 560560 plus 3076 to hear the next departure times. Located in Barrhaven, near the corner of Woodroffe and Strandherd. Can accommodate 342 cars and will eventually hold up to 765 vehicles. Call 613-560-1000 plus 3048 up to 6 days in advance or text 560560 plus 3048 to hear the next departure times. Located across from the Place d’Orléans Transitway Station. On an average weekday, the Place d’Orléans Park & Ride lot fills up by 8 am. 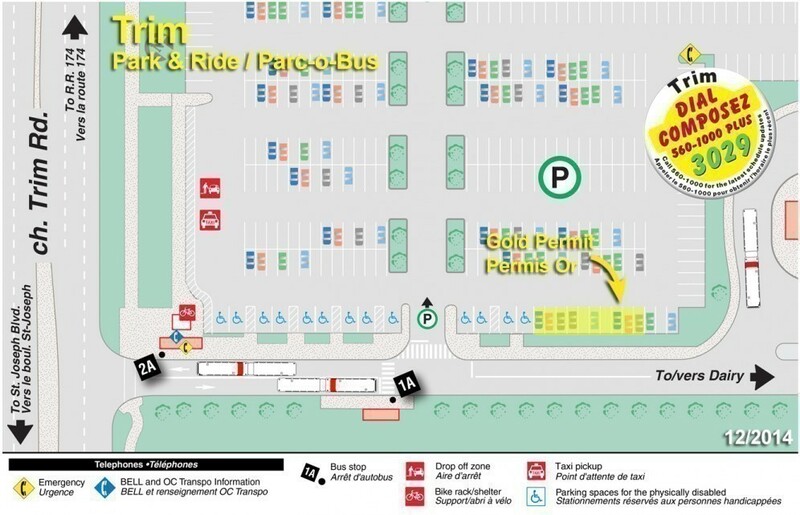 The extra Park & Ride spaces provided by Place d’Orléans Shopping Centre have moved to a convenient covered lot, just north of their former location. You can access this new lot by the mall’s west entrance on Place d’Orléans Drive. Please obey all signage and only park in designated spaces. Alternate parking spaces in Orléans are also available at Trim and Millennium Park & Ride lots. Call 613-560-1000 plus 3028 up to 6 days in advance or text 560560 plus 3028 to hear the next departure times. We are currently sold out of Gold Permits for the Place d'Orléans Park & Ride. Can accommodate 10 cars (one accessible spot) for Permit holders ONLY. Call 613-560-1000 plus your 4-digit bus stop number up to 6 days in advance or text 560560 plus your 4-digit bus stop number to hear the next departure times. Located in Riverside South on Earl Armstrong Drive. Call 613-560-1000 plus 3040 up to 6 days in advance or text 560560 plus 3040 to hear the next departure times. Call 613-560-1000 plus 3044 up to 6 days in advance or text 560560 plus 3044 to hear the next departure times. Located adjacent to Kanata City Walk Centrum Shopping Centre and Highway 417. On an average weekday Terry Fox Park & Ride fills up by about 9:30 am. Call 613-560-1000 plus 3058 up to 6 days in advance or text 560560 plus 3058 to hear the next departure times. Located at Trim and Regional Road 174, it's a great alternative to Place d'Orléans Park & Ride as it's just minutes away. Served by rapid transit route 95, Route 22 and Connexion Route 221, and local route 122. Call 613-560-1000 plus 3029 up to 6 days in advance or text 560560 plus 3029 to hear the next departure times.